You are invited to Sing!Sing!Sing!, a no-audition, no-commitment, live-music, popup singing group, where the audience becomes the choir. Each night, the audience is led by the Sing!Sing!Sing!, (Sing3), music team to learn a 2-3 part harmony arrangement of a particular pop song. Once things are sounding pretty good, we audio and/or video tape our “masterpiece” and post it online. Singers choose the part they wish to sing; lyrics are handed out or projected for all to see. Singx3 meets most 1st, 3rd and 5th Mondays. 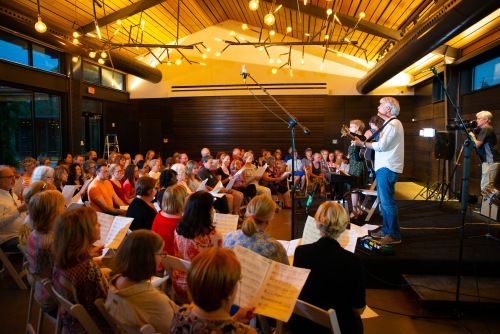 Singing 7 – 9:15 p.m.
Public serenade: Around 9 -9:10 pm, we finish recording and invite any and all to drop-in for a free serenade!